Last updated 08 October 2018 . By Georgia Evans. As King's Cross continues to redevelop its eateries, it seems there is a growing need for more bars. 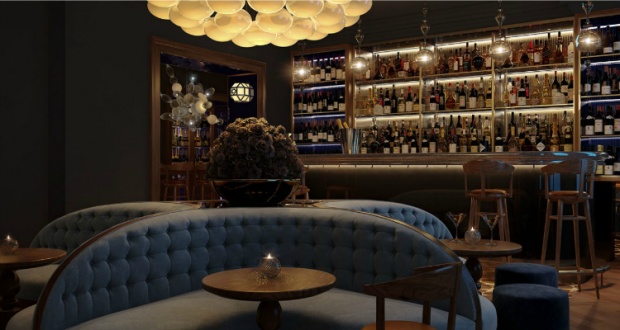 Anthracite, a new martini lounge set to open in the Great Northern Hotel, is going to be the first of its kind in the area, and promises to be a luxurious escape from city life. Taking inspiration from the coal it was named after, the new lounge, which is replacing the current Snug Bar, is decorated in dark tones, with metallic details and electric blue trims. The evenings will give the impression of a sultry cocktail lounge, while the daytime allows for natural light to fill the space through the floor to ceiling windows. The bar menu will be focused on martinis, offering classics such as the espresso and breakfast martini, made from a curated selection of gin, vodka and vermouth. There will be bespoke cocktails on offer alongside these classics, the coastal martini sounds particularly interesting, with Samphire infused gin, cured lemon infused Mancino, black pepper tincture, pumpkin, chilli oil and a garnish of seaweed crisp.